Tune in to this thought leadership discussion to learn how VMware, WWT and bChannels are optimizing around online marketing to get the best return on their MDF marketing investment. B2B marketing is rapidly evolving as buyers continue to use the web to self-educate their purchasing decisions. Successful marketers have capitalized on this opportunity by creating, distributing and measuring multimedia content that drives audience engagement, thought leadership, brand awareness, and lead generation. 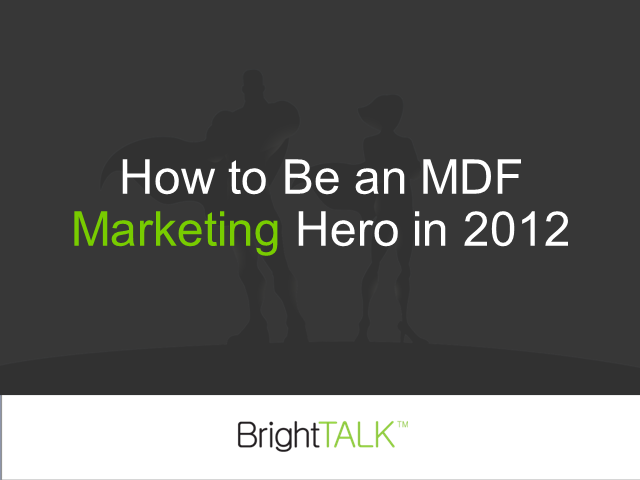 Tune in to find out how you can apply some of the insights and best practices to your 2012 demand generation campaigns. Sarah Vaughan, Marketing Manager at World Wide Technology (WWT) who started driving MDF innovation in sales by overseeing the implementation of salesforce.com across more than 400 users and then proceeded to connect the sales systems with marketing to measure ROI and provide technology partners reliable proof of performance. Riadh Dridi, Head of Partner Marketing for VMware. His organization is responsible for channel loyalty and development programs. Prior to joining VMware, Riadh managed HP's partner organization and was responsible for driving demand and revenue for industry vertical segments. Chris Bard, co-founder and International Development Director at bChannels, a leading global specialist in the development and management of indirect channel programs for technology companies. Prior to joining bChannels in 2003, Chris was responsible for managing the EMEA Channel for the Xerox Office Business, including the integration of the Tektronix printer business bought out in 2000. - What are the buyer trends that should be taken into account when planning for 2012? - What are simple things I can do right now to optimize revenue generation for 2012? - How do I prove my programs are working and get more MDF marketing budget as a result?